Japanese indicators largely show growth moving ahead but recent indicators show some backtracking; thus, suggesting that this notion of a global acceleration is either overblown or not including Japan. Japan's Economy Watchers index, a service sector gauge, stepped back to post a 49.1 value in January, down from 53.9 in December. The employment gauge also weakened month-to-month, but the future gauge remains above the value of 50 and also moved higher in January The Markit manufacturing gauge also moved slightly higher and remained above the 50 mark; in January it has a 91st percentile standing, far higher than the Economy Watchers' rank standing (at its 55.9 percentile). But the Economy Watchers' future gauge has a 78.5 percentile standing and even the employment gauge that backtracked slightly has an 83.9 percentile gauge. All these signal solid growth at least relative to the performance of the last 10 years. The Teikoku survey has sector gauges we can use to double-check the other gauges. 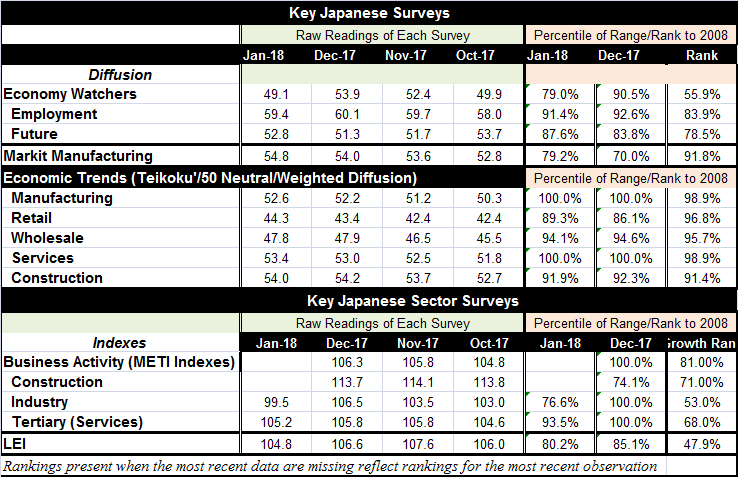 The Teikoku manufacturing and service sector gauge each advanced in January and each was also above the diffusion neutral point of 50. And each of these gauges also has a very high standing in its 98.9 percentile for both over the period since 2008. The Teikoku gauge is in reasonable agreement with the manufacturing gauge from Markit, but its service sect assessment is higher. However, the Teikoku retail gauge rose on the month as wholesaling ticked a bit lower, and both of these sectors have below 50 gauge readings. Yet, their respective standings since 2008 are in both cases above their respective 95th percentiles. This is a mixed message. Below 50, the index says conditions are declining. But the high percentile standing indicates that this is one of the best performances over the last ten years. Clearly, the bard service sector faces some cross currents. The Teikoku construction gauge slipped slightly in January, but it is still above the 50 mark and has a percentile standing in the top 9% of its historic queue of data since 2008. The METI sector indexes as yet are incomplete in January, but the manufacturing (industry) gauge is available and it moved quite a bit lower to a 53rd percentile standing in terms of its growth over the past 12 months evaluated vs. the same performance over the past ten years. The services sector (tertiary) index, just released today, also bumped lower in January but with a much higher 68th percentile queue standing in terms of its 12-month growth rate. The Japanese data show more prevarication than do the reports from other countries at this time. The OECD is going ahead with an upgrade to its outlook; it now anticipates 3.9% growth in 2018 and in 2019. This is a fresh forecast hike it has just announced. And it has gone ahead with this upgrade even in the face of the risk of the potential for some sort of trade war. Generally, there is a mood of optimism about global growth. Policy in the U.S. is stimulative and globally growth has been taking hold especially in Europe. However, Asian PMI data have generally been weaker. Japan's situation is an example of this. The situation remains in flux despite the optimism.